About a quarter of adults in the U.S. (24%) say they have a lot of confidence that new medicines and treatments have been carefully tested before being made available to the public. 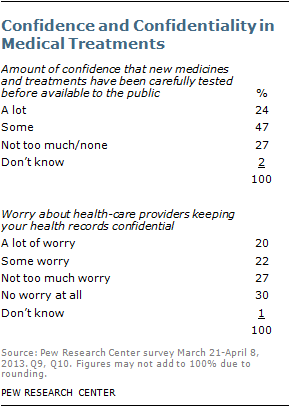 Roughly half (47%) have some confidence, and 27% have either not too much or no confidence that new medical treatments have been carefully tested. Confidence in the testing of new treatments is modestly related to personal wishes for radically longer human lifespans. Adults who express a lot of confidence that new medicines are carefully tested are evenly divided in their assessments of radical life extension for society, while those who express less confidence in medical testing are more inclined to say that radical life extension would be a bad, rather than a good, thing for society. The same pattern occurs when it comes to personal preferences for radical life-extending treatments. A majority of U.S. adults (56%) say they, personally, would not choose to undergo medical treatments to slow the aging process and live to be 120 or more. But roughly two-thirds (68%) think that most other people would. And by similarly large margins, they expect that radically longer life spans would strain the country’s natural resources and be available only to the wealthy.